After some researching on most easier way to do that, I finally found the solution that suited my needs. Let me share with you the simple way to use Popup Dialog from adminhtml area I used. 1. Create some Adminhtml form block in which you will add the button that will call our popup dialog. As you can see, we added our edit screen’s block in content and set the custom template to it. Also we added some css references into the head block in order to apply predefined Magento admin theme styles on out Popup dialog. Here you can see the function openMyPopup() that opens the dialog. Also, you can notice that we have the callback function onClose() implemented: that triggers after we close Popup dialog. 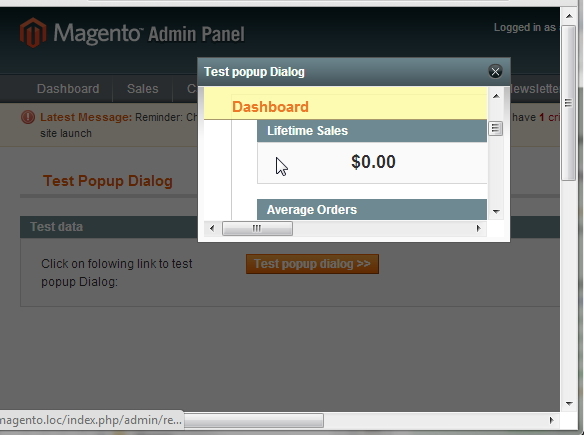 As you can see we use Magento’s Dialog class to create popup dialog. It can take number of configuration options that we can use to make this dialog popup suit our needs. To get more info on Dialog class and its options, just take a look at the “js\prototype\window.js” file in your Magento installation files. What if I’m new to Magento and don’t know how to transfer this code to my own module. Any other guides I need to read before doing this? Popup window in magento is really made easy from this article. can u help me in closing the popup by click outside the (popup) window. is magento css really needed ? at my end it loads a white page with display none. How to add image in header of popup at place of ‘Test popup dialog’. And How to add custom button at place of close button ? Below code is not working. popup working but in popup page header footer also calling how to solve this one. I want to display the order success message in the popup once the order was confirmed instead of redirecting to the success page. @Gen you would need to include a layout file and load the CSS files for the theme. Thanks for the code..it is very useful.. This is good but it dosent work in IE8 (not sure abt other versions). It throws error “Object doesn’t support this property or method” in window.js line no-1549 (win.getContent().innerHTML = content;). I spent lot of time debugging but no success. Any suggestions please. How would you do this in the front end? I’ve been trying to use window.js for popup image in the product page but with no sucess… Thanks! Thanks for the code, very useful – although my popup window is not opening as a popup but rather it’s launching within the active window in the top left hand corner. Is there a “target” variable we need as well? @Gen, you should check loaded Magento admin js files and css in your page. You are right and i have fixed this issue please open default.css file PATH : “js/prototype/windows/themes/default.css” and copy all code and past in custom.css file PATH : “skin/adminhtml/default/default/custom.css” and check i think your issue is fixed…. 🙂 Thanks!